You’ll find a forest of fragrant Christmas Trees, all different and all decorated by a local charity, or business, or voluntary group. Add a star to a tree for someone born this year; remember someone you love on our Tree of Remembrance, or make a decoration to add to tree. It’s FREE to visit. You can also make a donation which this year supports the work of local charities Birthlink, Blood Bikes, and The Welcoming. 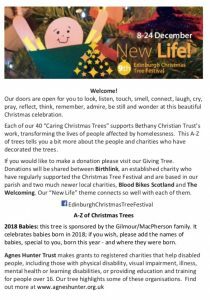 Visit the Festival facebook page for updates and download our Welcome Leaflet to find out more about our trees and their sponsors. We’re open 10am-6pm , and until 9pm on Thursdays for you to pop in for some peace and quiet. On Friday 21 December we close early at 2pm to prepare for Carols at Six so we’re not open that afternoon. But please come to Carols at Six – it’s amazing.